A large audience was present in Montreal last Friday evening to hear the American violinist Hilary Hahn on tour with pianist Cory Smythe. Ms Hahn’s warm and engaging personality helped to dispel the cool and rainy weather concert goers had faced on the way to the Maison Symphonique. And then there was the music! Ms Hahn is well-known for her championing of modern music as well as pairing modern pieces with well established parts of the repertoire. 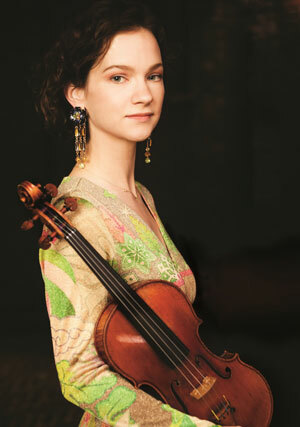 Hahn’s current tour follows the release of her latest CD, 27 Pieces: The Hilary Hahn Encores. She undertook this project to encourage contemporary composers and to increase the repertoire of encores available for classical artists. She is playing two of these compositions on tour. These contemporary works tied in well with the overall theme of the evening which was thematic development and fantasy. The first composition performed was by Richard Barrett, one of the 27 Pieces. This interesting brief work sounded modern going on avant-garde. It reminded me of Luigi Nono on a busy day. There was a lot going on here with snappy changes in dynamics and interesting exchanges between the two performers. We then heard Hahn perform solo in Telemann’s Fantasia No. 6. The playing was wonderfully warm. This was a great treat since in recent years solo violin works by Telemann’s contemporary J.S. Bach have been more popular. For example, Hahn herself chose a Bach piece as an encore when performing with the OSM here in April, 2012. Next was another work from the 27 Pieces album, this time by Antón García Abril, which Ms Hahn explained should be considered as “impressionist”. The first of the Three Sighs was moody indeed. The second Sigh, which calls for solo violin, had what seemed a country flavour (perhaps the double stops). In the third, playing again with her pianist, we started with an eerie sensation that seemed to morph into an almost jazzy conclusion. Very enjoyable. The recital program indicated a sonata by Mozart but not which one. Ms. Hahn announced it was to be the great Sonata in A Major, K. 305. Unlike many sonatas for violin and piano which favour one or other of these instruments, including in some of Mozart’s own compositions, here Mozart has given each an equal role. Mozart’s masterful writing interpreted by the prodigious talents of Hahn and Smythe made this a highlight of the evening. The joyful first movement demonstrated their strong work as a team and led to spontaneous applause. The second movement with its wonderful variations (including solo piano parts followed by the violin taking over) was greeted with hearty applause as we headed to intermission. Following the break, we heard the sombre and restless Phantasy by Schoenberg. The playing was strong with deep tones throughout, and Ms Hahn’s technical skills were evident. The piece ended almost as a surprise. The last work in the program was the Fantasy in C Major, composed by Schubert in 1828, the final year of his short life. This, like the Telemann, is another composition which is not performed that often in concert. The audience sat in rapt attention as Hahn and Smythe took us through the four uninterrupted sections. It is hard to single out any part of this work as the playing was all excellent, although for my mind the third section, with Schubert’s variations on his song Sei mir gegrüsst (Greetings to Thee), was the most beautiful of all. As an encore, Ms Hahn premiered a contemporary piece, being one which she had given honourable mention in her 27 Encores project. This was by Mark Gresham and featured catchy Cuban-inspired melodies for the violin part, though it must be stated that the piano writing suffered by contrast to what we had just heard in the Schubert masterpiece. The audience left the hall in an upbeat mood following the recital. It seemed only fitting that by this time the rainfall had mostly subsided, perhaps due to a nod from the great Schubert himself. Stephen Fogarty is a classical music fan and amateur violinist. He works as a practising attorney in Canadian immigration and citizenship law at his office Fogarty Law Firm in Montreal, Twitter @Stephen_Fogarty and website www.fogartylaw.ca. He is a member of the Quebec Bar and of the Law Society of Upper Canada, and honorary legal advisor to the Embassy of Ireland in Canada. The views expressed in this article are Stephen’s alone and do not purport to reflect those of any other person or organization.